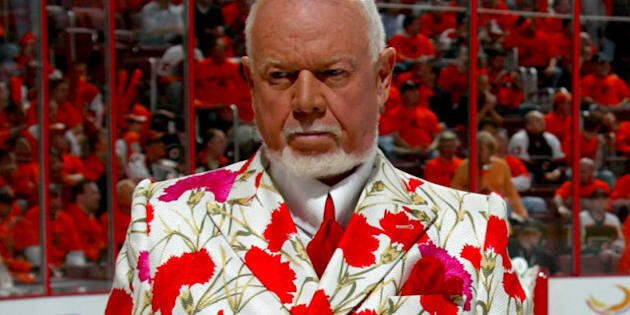 TORONTO - Don Cherry's wardrobes are overflowing. The "Hockey Night in Canada" fashion plate keeps all his eye-popping suits. Not out of vanity but out of necessity. He gave one away to charity some years ago and then was immediately flooded with requests with more. Unable to fulfil all of them, he opted to hang on to them so he's not accused of favouritism. That comes at a storage cost. "I've got a bedroom full of suits and I've got every closet full of suits. My wife (Luba) has one little closet," the 80-year-old Cherry said in a recent interview. "I don't wear them for two or three years and people kind of forget them. Some they don't forget. The pink one (he wore at Rob Ford's mayoral swearing-in) they never forget." Cherry, who still gets the material for his suits from Fabricland, has no idea how many suits or shirts he has. And he is grateful for his wife's patience when it comes to his trademark clothes. "She puts up with it anyhow."